Betconnect Review 2019 - Boost your matched betting profits! Matched betting is a method of making a profit from bookmaker free bets and promotions. Our profit comes mainly from these free bets or triggering a refund of sorts. We generally know how much profit we will make from a free bet based on 80% of it's value and so the only other factor to consider when determining our overall profit is our qualifying losses. Well, what if there was a way to qualify for bookmaker promotions such as free bet offers, horse racing refunds, best odds guaranteed and more, with ZERO qualifying loss every single time? Sound too good to be true? Well, it isn't thanks to a new service called Betconnect. £50 FREE FOR NEW CUSTOMERS! Sign up to Betconnect today, deposit a minimum of £10 and receive £50 bet credit to use on your first three bets! Betconnect is a platform which works like a betting exchange. It actually has different uses depending on the type of user but as matched bettors, we'll be using it like an exchange to place our lay bets. 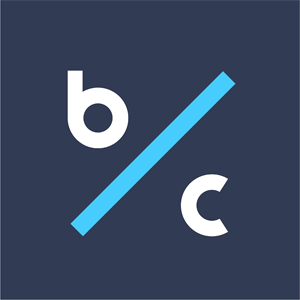 Betconnect was developed as a platform to allow bettors who have been restricted or banned from bookmakers to place bets. These users are able to submit 'Bet Requests' and other users can match them. The users who submit bet requests are called 'pros' and the users who match the requests are called 'punters'. As matched bettors, we'll be using Betconnect as punters and effectively acting as the bookmaker matching other peoples bets. Don't worry, keep reading and it will all become clear soon. As mentioned above, there are two types of users. Pros and Punters. Pros - These users have been restricted at bookmakers and use Betconnect to request bets to be placed. Punters - These users receive the pros bet requests and can match them if they wish. If they do then they are acting as the bookie and so if the pros bet wins, the punter will pay them the winnings (the liability) and if the pros bet loses, the punter will receive the pros stake. Remember, we'll be using Betconnect as punters as we don't have problems placing bets at bookmakers and it is by matching the pros bets that we are able to qualify for bookmaker offers with zero qualifying losses. More on that in a bit though. First let's take a look at a bet request. The image above is an example of a bet request you will receive as a punter. In this example, the pro has requested £7 on Arrowzone to win in the 17:45 at Wolverhampton at odds of 28/1. We can see that Betfair and Boylesports currently offer the same odds as requested on this horse to win whereas Betway and Skybet are actually offering higher odds. If we decide to accept the bet request, we would enter the amount of the requested stake we would like to match and click on either the 'Follow' or 'Lay' buttons. As we are acting as the bookmaker here, once we match the bet, the liability is deducted from our account which in this case is £196. The follow and lay buttons can be a little confusing but the only thing you need to remember is that these buttons do exactly the same thing. They're aimed at users who are using Betconnect as a kind of tipping service where you would either agree with the pros bet and Follow it, which means you would match their bet and place a bet of your own on the selection as you have confidence in it, or disagree with the pros bet and Lay it which means you would just match the pros bet. As matched bettors, it doesn't matter which option we click on as we're not using the site as a tipping service. Both buttons have exactly the same function and just display different information afterwards. Whichever option we choose, we will be matching the pros bet and so our Betconnect balance will be debited the liability of the bet. We then head on over to a bookmaker who is offering the same or better odds and place the same bet that was on the bet request. Therefore, we always break even or in some cases, make a risk-free profit. Ok, so we've established the basics of Betconnect. You break even with no losses as both bets cancel each other out. 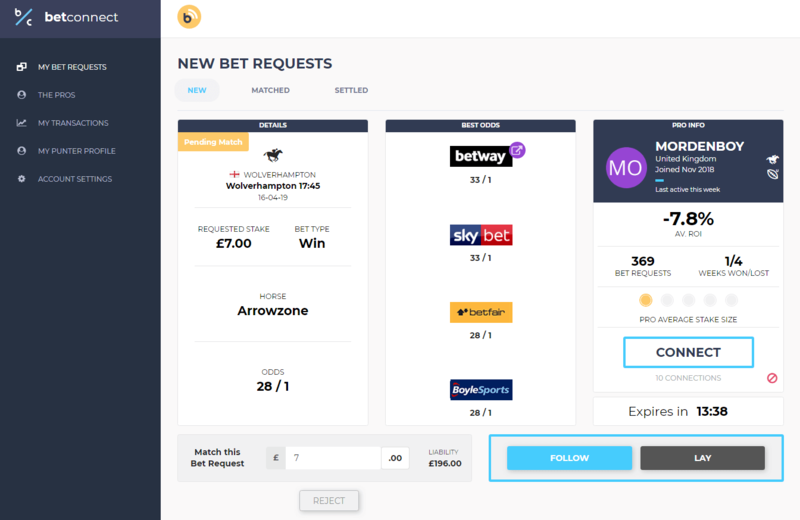 Now lets take a look at how we can use Betconnect to make qualifying for offers risk-free when matched betting. Using the example above, lets take a look at the possible outcomes and returns should we decide to match the bet request. We accept the bet request for £7 on Arrowzone to win at odds of 28/1. Our Betconnect balance is debited the liability which is £196. We place a £7 bet on Arrowzone to win with Betfair at odds of 28/1. Arrowzone wins: We lose £196 with Betconnect and make £196 profit with Betfair. Arrowzone loses: We win £7 with Betconnect and lose £7 with Betfair. As you can see, whatever the outcome, we break even. If we placed our bookmaker bet with Betway or Skybet, we would have actually made a profit but I used the same odds in this example to emphasise the fact that we incurred no losses. So, we now know that we can't lose money matching our bets using Betconnect but how do we make a profit? As we can place bets covering all outcomes of an event and incur no losses, it means that we can participate in bookmaker offers risk-free. Going back to the example above, should a bookmaker be offering Money Back if 2nd on that race, we would qualify with no losses and have a risk-free chance of receiving a refund. Should we receive a bet request for an eligible football match, we may be able to qualify for 2 UP risk-free. Let's say that we received a £100 bet request for Man Utd to beat Chelsea at odds of 2/1 (3.0). We accept the bet request and £200 is deducted from our Betconnect balance. We then place a £100 bet on Man Utd to win with Bet365 at odds of 2/1. Man Utd win: We lose £200 with Betconnect and win £200 with Bet365. Man Utd lose: We win £100 with Betconnect and lose £100 with Bet365. However, if Man Utd go two goals ahead during the match, Bet365 will pay our bet out as a winner but we still have our Betconnect lay bet running. We could then place an additional back bet on Man Utd to win and lock in a profit regardless of the final result. Many bookmakers offer Best Odds Guaranteed on horse racing and we can use Betconnect for a risk-free chance of making a profit should our horse win and the odds drift. However, if Arrowzones starting price is greater than the odds of 28/1 which we backed it at and it wins, we'll make a profit. Let's say that Arrowzone goes off at odds of 33/1. Arrowzone wins: We lose £196 with Betconnect but make £231 with the bookmaker giving us £35 profit. As you can see, there is no possible outcome which results in us losing money and a risk-free chance to make a profit on every single bet we place. With free bets, we generally expect to turn around 75% - 80% of the value of the free bet into cash. 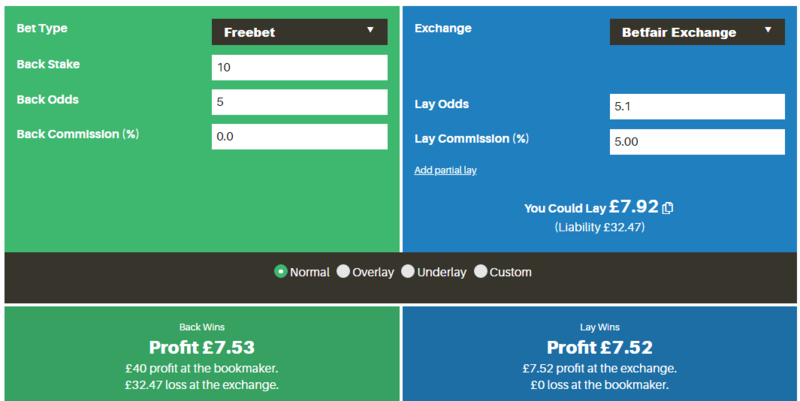 For example, if we had a £10 free bet, we'd expect to make around £7.50 - £8 from it using matched betting. However, using Betconnect, we're able to extract more cash from our free bets due to being able to get perfect matches every time and not paying any exchange commission. The calculator above shows us that we would make around £7.50 profit by backing and laying a good match and paying Betfairs 5% commission. Now let's see how much we could make from our free bet using Betconnect. 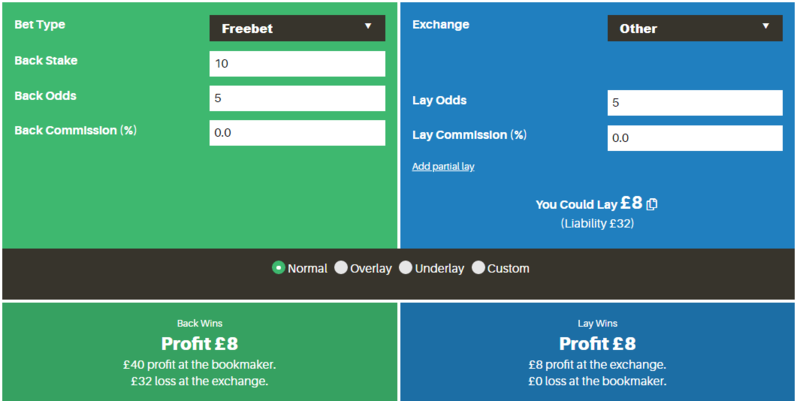 As we get a perfect match with Betconnect and pay no commission, we're able to make £8 from our free bet which is a significant increase. Betconnect is an exciting new platform which we believe will become extremely popular among matched bettors. Qualifying losses play a big part in how much profit you make and which offers you decide to do as a matched bettor and Betconnect solves that problem. If you'd like to try Betconnect, you can claim £50 in free bet credits to use on your first three bets with them. To receive £50 free, simply register a punter account and deposit a minimum of £10. This is an excellent sign up offer which we don't expect to be around for long so claim it while you can.